← Unlikely Story 11: The Journal of Unlikely Cryptography is Here! Damien Angelica Walters’ short fiction has appeared or is forthcoming in anthologies and magazines such as Year’s Best Weird Fiction Volume One, The Best of Electric Velocipede, Glitter & Mayhem, What Fates Impose, Lightspeed, Shimmer, Shock Totem, Jamais Vu, Apex Magazine, Strange Horizons, Nightmare Magazine, and others. 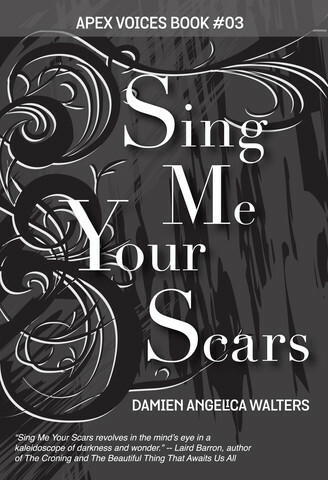 Sing Me Your Scars, a collection of her short fiction, will be released on March 9, 2015 from Apex Publications. Paper Tigers, a novel, will be released in late 2015 by Dark House Press. She’s also a freelance editor, and until the magazine’s closing in 2013, she was an Associate Editor of the Hugo Award-winning speculative fiction magazine, Electric Velocipede. She lives in Maryland with her husband and two rescue pit bulls. ACW: First off, let’s start the interview with some exciting recent news. Your story, ‘The Floating Girls: A Documentary‘ is a finalist for the Bram Stoker Award. Congratulations! Where were you when you heard the news, and what did you do to celebrate? DAW: Thank you! It feels very, very surreal. I thought nominees were notified beforehand, so I assumed my story didn’t make the ballot. I was sitting at my desk, drinking coffee and mulling over story notes when I saw that the nominees were posted. I clicked the link to see if Usman made the ballot because I hoped so–and he did!–and when I saw my story listed there, too, I blinked a few times and double-checked the link. When it hit that it wasn’t a mistake, I just sat for a few minutes, staring at the screen. Then came the flailing hands and the social media buzz, and at the end of the day, I celebrated with a glass of Merlot and a bit of chocolate. ACW: And the second bit of congratulations, your collection Sing Me Your Scars was just released. What type of stories can readers expect to find in this collection? DAW: Thank you kindly. Sing Me Your Scars is a collection of mostly dark fantasy and horror although I selected stories with cohesive themes of love, loss, strength, and hope as opposed to by genre. You’ll find origami elephants, a magician in war-torn Lithuania, Henry VIII, women who can create bridges and building with their songs, and in the title story, an homage to Mary Shelley. ACW: The collection sounds fantastic. You also have a novel coming up later this year, Paper Tigers. Care to tell us a bit about it as well? DAW: Paper Tigers is about a disfigured young woman and a photo album she finds at a thrift store. At its heart, it’s a ghost story, but it’s as much about the things that haunt us personally as it is about the external ghosts. ACW: Obviously you’re a very prolific short fiction writer, and with your second novel coming out, you’re equally comfortable with long fiction. What is your process like for a short story versus a novel? Do you find switching mental gears between long form and short form difficult? Are you able to work on short fiction while you have a novel going, or do require completely different headspaces for each? DAW: I don’t have one set process for either. Sometimes I sit at my desk in front of a blank Word document; other times I curl up on the sofa with notebook and pen. In the first draft stage, I tend to work on one thing at a time, whether it’s long form or short. I need that focus to find the story threads and make them comprehensible. They do require different headspaces—novels have a larger scope and more threads. But while it’s nice to spend a long time with a character or a group of characters, I enjoy writing in the short form more. I don’t have to commit to one genre, and I can experiment with form and voice and tense and points of view. ACW: You have a knack for coming up with lovely and poetic titles for your fiction – The Serial Killer’s Astronaut Daughter; The Floating Girls: A Documentary; Grey in the Gauge of His Storm; and Such Faces We Wear, Such Masks We Hide, to name a few. What is your secret for coming up with such evocative and intriguing titles? Does the story come first, or the title? DAW: I don’t think I have secret, but I see titles as both an introduction and an extension of the story, not just as a label. I’d say it’s fifty-fifty with respect to which comes first, although if it doesn’t come first, it usually comes not long after I’ve started writing the story itself. But sometimes I reach the end of a story, realize the original title was all wrong, and then agonize over finding the right one. It’s a bit like digging through a puzzle for the right piece or finding the perfect seasoning for the soup. ACW: Some of your stories carry echoes of Angela Carter, Shirley Jackson, and Charlotte Perkins Gilman. Are any of these authors conscious influences? If not, which authors (if any) would you say most influenced your literary style? Regardless of influence, who are some of the authors you love as comfort reads, to challenge you, or to recommend to friends? DAW: What a trio of amazing talent that is; thank you for such a huge compliment! They’re definitely not conscious influences, but I think writers are influenced by everything they read. Like the majority of authors who write dark fiction, I’d count Stephen King and Shirley Jackson as early influences, but with time I think my style and voice has developed, and is still developing, into something of its own. Stephen King is definitely a comfort read, and I’m also partial to thriller and suspense novels, like those by Gillian Flynn and Laura Lippman. Hard science fiction is definitely a challenge for me, but I’m currently reading The Three-Body Problem by Cixin (translated by Liu, Ken Liu) and love it. ACW: Switching away from books and writing for a bit, let’s talk about dogs. You have two rescued pit bulls. What are some of the most endearing things they do? What are some of the most aggravating? DAW: Ripley is a lap dog, all fifty-pounds of her and it’s both endearing and aggravating. Endearing because she’s love bug; a little aggravating because fifty pounds is heavy. Kane is seventy-five pounds and doesn’t try to be a lap dog anymore; he likes to curl up next to me. It’s sweet and lovely until he farts and when he does, it’s as if he’s released a toxic cloud of epic proportions. ACW: With your steady conquering of the world of short fiction and novels, what are you working on next? DAW: I’m attempting to wrestle my love of short fiction into the long form by way of a portmanteau novel, a series of stories connected by a larger framing story revolving around stories and storytelling and families and the secrets they keep. ACW: Sounds fantastic! I can’t wait to read the collection, and the novel(s). Thanks for dropping by! DAW: Thank you so much for asking me here!